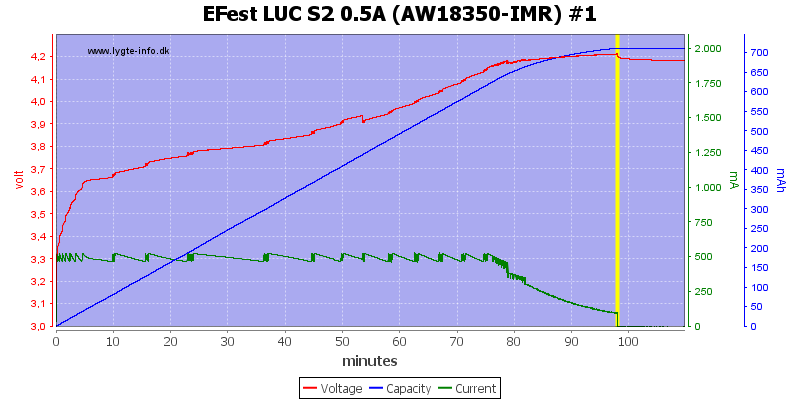 Efest is know for chargers and LiIon batteries, especially IMR where they have many sizes. This is a new model charger with a special design, that makes it look different from other chargers. 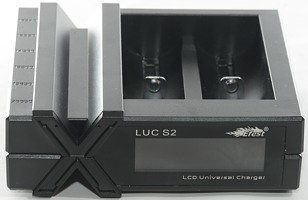 The charger can charge two batteries up to 26650 in size and has 3 currents (0.5A, 1A and 2A) and usb output. The charger arrive in a brown cardboard box. 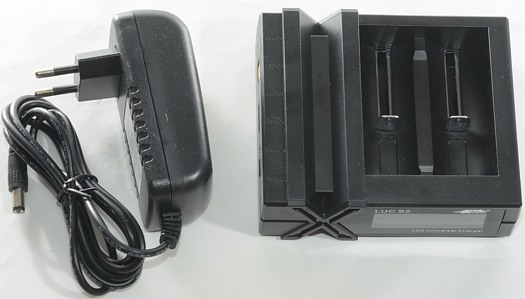 The box contained: Charger and mains power supply. On the side of the charger is the DC input, usb output and a single button to select charge current. The front of the charger has a display show selected current, battery voltage and status (i.e. charging or not). When charging or usb output is active the two arrows are animated. The slider construction is working very smooth in this charger. 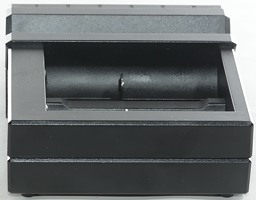 The slider can work with batteries between 30 mm and 69.4 mm. 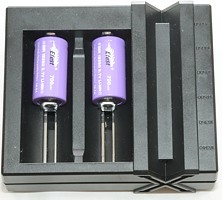 This prevents it from charging the longest protected 18650 batteries and some protected 26650 batteries. 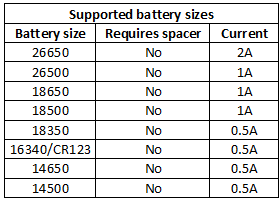 The charger has a list of supported battery sizes, but it is not very readable. 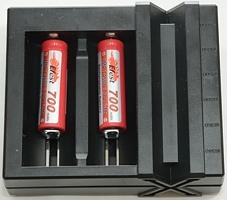 The charger can handle 69.3 mm long batteries including flat top cells. 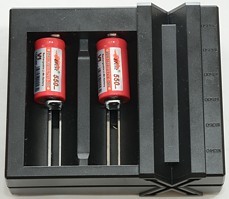 Below 0.6 volt the charger will not charge, this means it cannot reset protected batteries. Between 0.6 volt and 3.0 volt the charger will charge with 30mA or below. 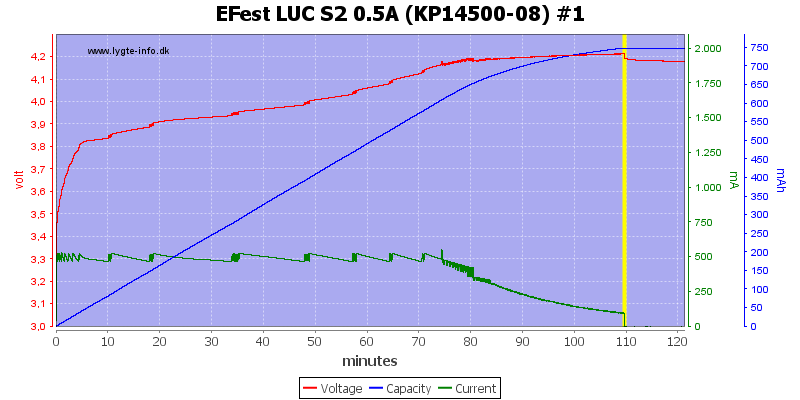 Display will show volt and animation from 0.6 volt, but voltmeter precision is bad at that voltage. (Shows 0.9V). From about 1.6 volt the meter will show correct voltage (within 0.1 volt). Voltmeter will not show above 4.2 volt. Charger will restart if voltage drops to 4.15 volt. Charge will not restart charging after power loss, or battery insertion. Charge current can be changed at any time during charge. When charging is finished the charger will draw 0.1mA from the battery. 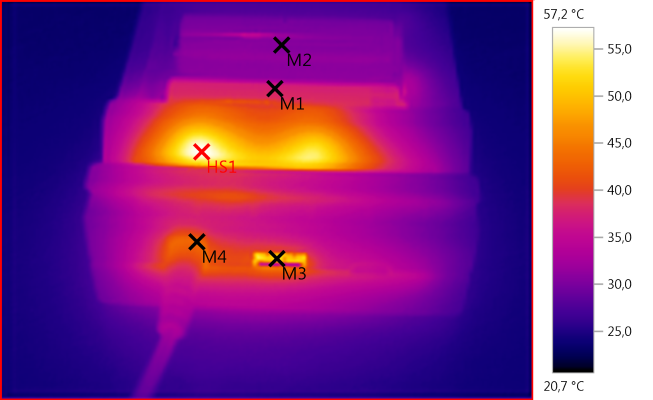 When not connected to power it will drain about 0.1mA from the battery in slot #1. 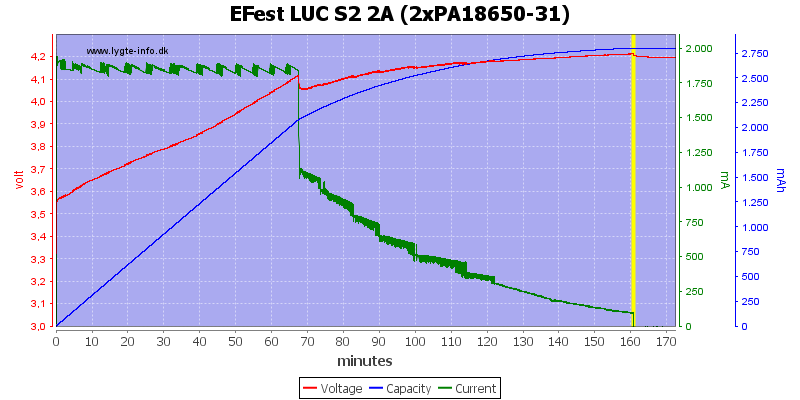 When not connected to power it will drain about 3mA from the battery in slot #2 (usb). 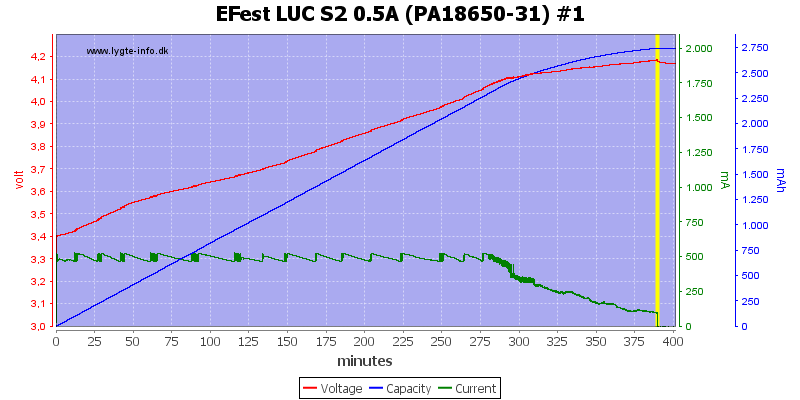 First test is a Panasonic 18650 with 3100mAh capacity. The charger uses a CC/CV curve with 100mA termination. It looks like it is a simulated CC/CV, i.e. 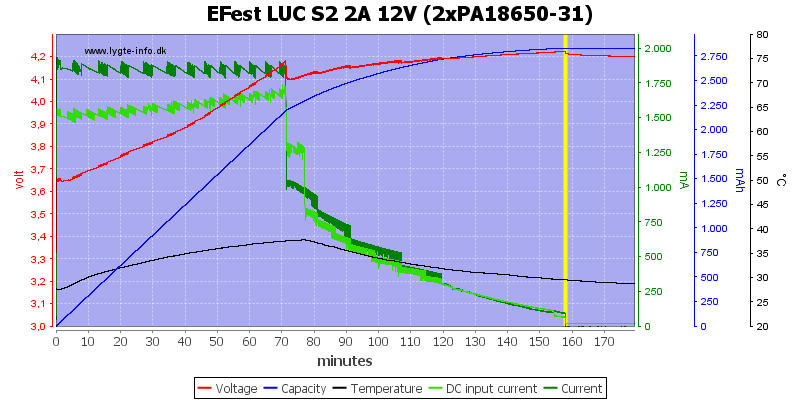 it is not using a constant voltage, but simply reducing the current when voltage gets near to 4.2 volt. The step in the curve slows the charge down a bit, but that is all it does. Second channels works the same way. The 3400mAh cell works exactly the same way. The 0.5A charge works fine, but I wonder why it termiated at a slightly lower voltage than above. 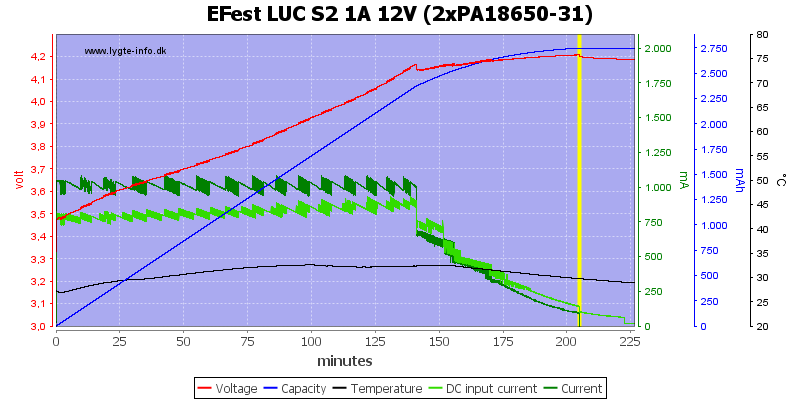 The termination current is about 100mA, I would have liked it lower. 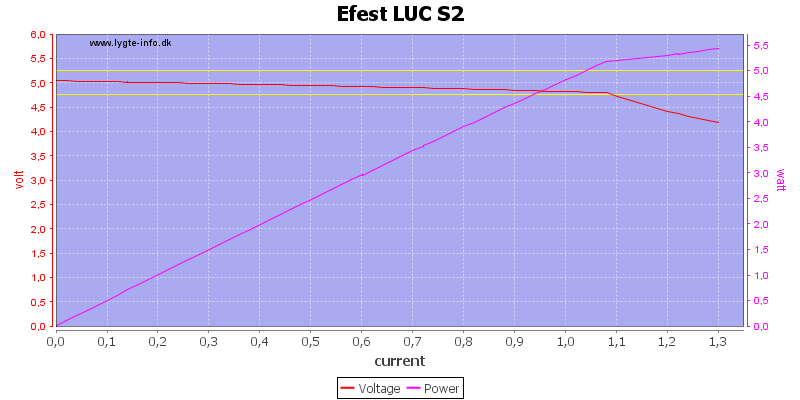 Again the current has a significantly drop and the charge is finished at a lower current level. This will make the charge a bit slower, but does not affect the batteries. 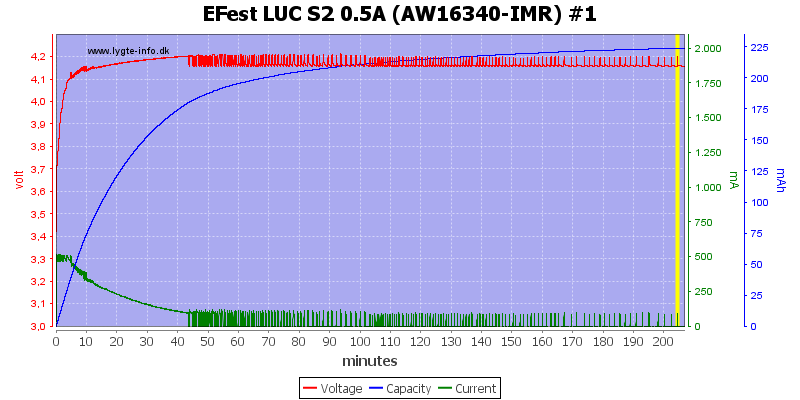 The charger can handle my old IMR cell even at 2A, but the curve looks a bit funny. The reason is the rather high restart voltage and the old cell. 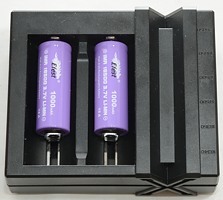 The cell has a considerable voltage drop when charging is finished and this makes the charger restart, until the cell is stays above 4.15 volt when charge is terminated. The same happens at 0.5A. 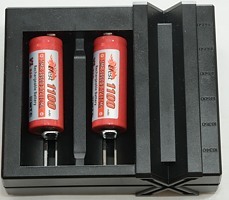 Charging cells, that is not worn down, works without any strange termination problems. There is no problem charging two cells at once with 1A. 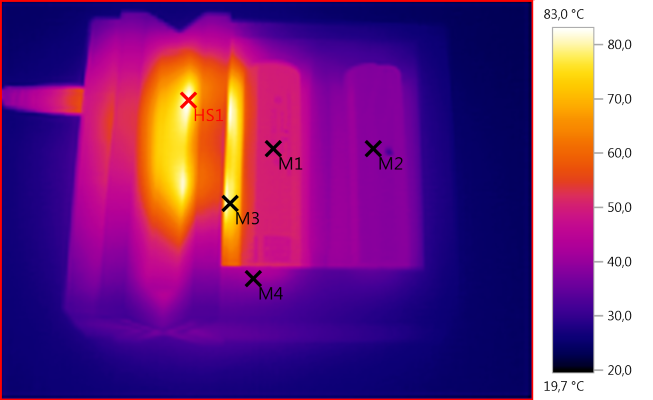 The temperature trace is from the coolest cell (See IR phot). Charger needs about 1A for 1A charging. IR photo is for 1A chargign. With the electronic at one side, it will only heat one battery. 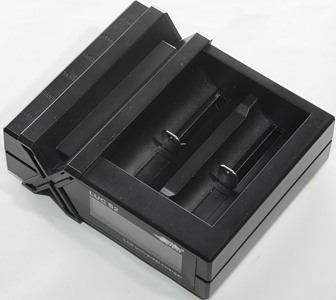 There is no problem charging two cells at once with 2A. 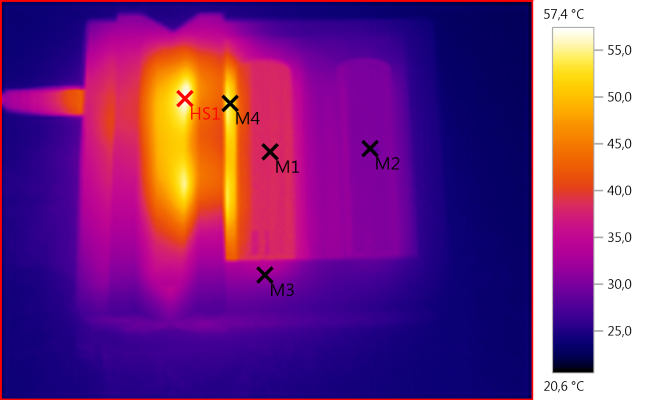 The temperature trace is from the coolest cell (See IR phot). Charger needs about 1.8A for 2A charging. 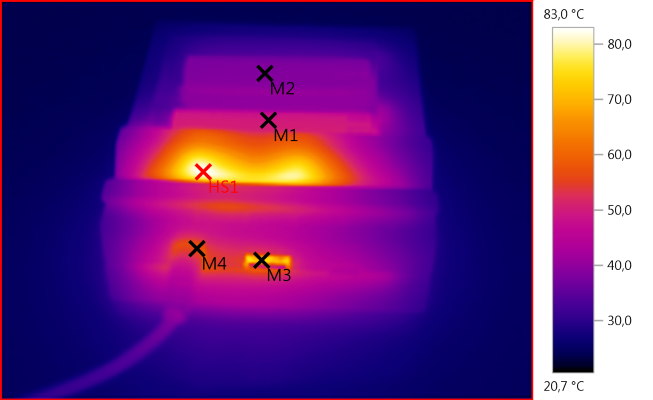 With 2A charging the charger and batteries get hotter. The charger uses a slowly ramping current when starting charging. This slow ramp is also used when changing charge current. 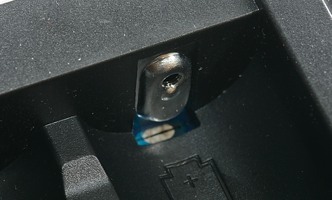 Only slot #2 (The one farthest from the connector side) can be used for usb output. 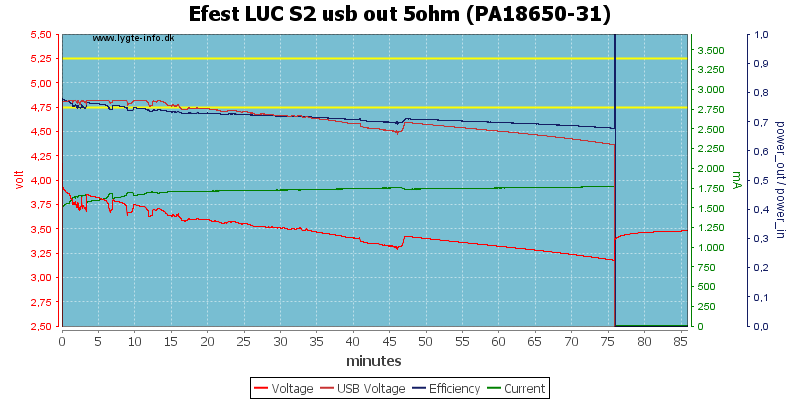 Turns usb output off after 40 seconds when load is below 27mA, but much faster when unloaded. Background light on display is on when usb output is active. 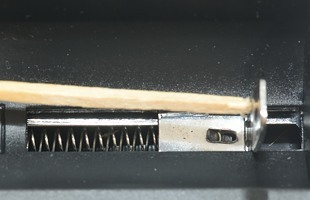 Display shows a battery symbol when usb output is active, the number of bars indicates the battery charge state. Charger uses about 28mA when usb output is on, but not loaded. The load sweep shows that it can deliver 1A, before the voltage drops and at 1.3A the output is turned off. This is a good design. 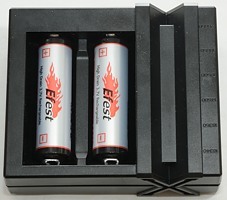 At 0.5A output it has a stable voltage for more than 2.5 hours with 3100mAh batteries. 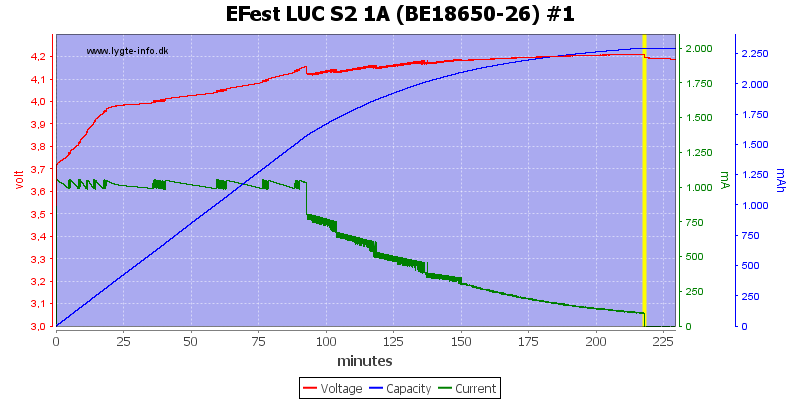 2600mAh means a bit shorter runtime, but due to the higher voltage not very much shorter. 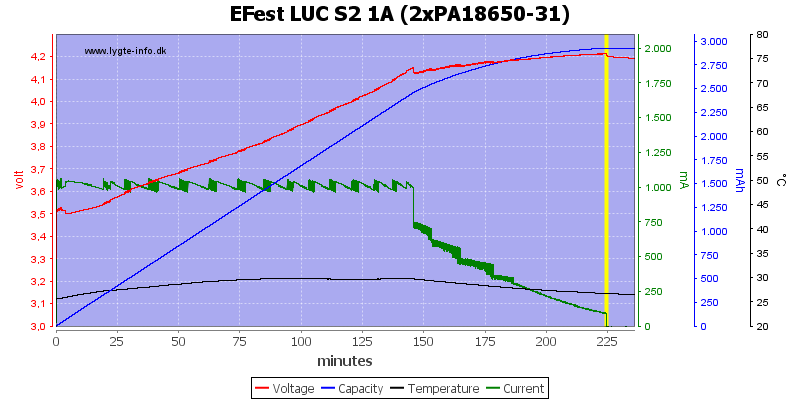 Increasing the current to 1A does not work very well, it has problems keeping the voltage up and the efficiency is down to 70%. 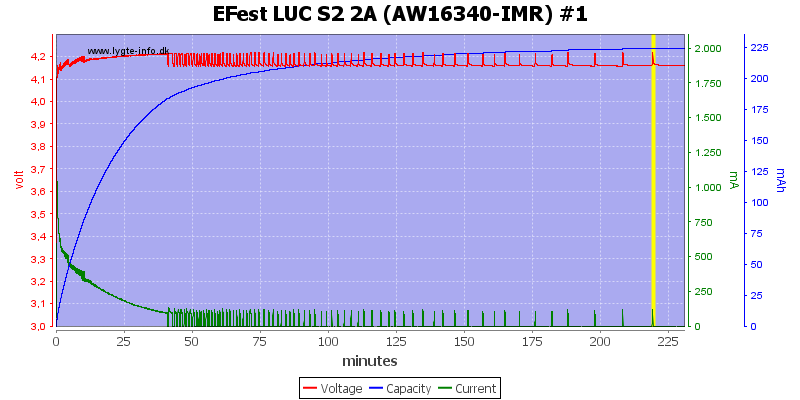 At 1A the noise is 25mV rms and 155mVpp. At 0.5A the noise is 12mV rms and 80mVpp. It is nice to see a charger that tries a different design and also works fine when charging. With the 3 charge current it supports a wide range of battery sizes and fairly fast charging (The charge current could be optimized, to make it a bit faster). 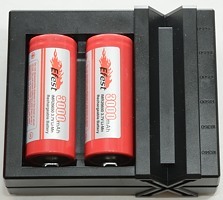 I would have liked a cooler battery when charging at 2A, but for a compact charger without any fan it is difficult to do. 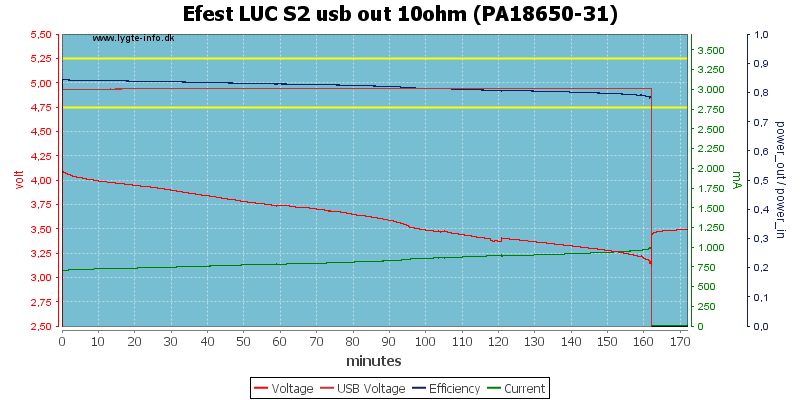 The usb output is fine for 0.5A, but could be better at 1A. The final verdict must be that it is a good LiIon charger. 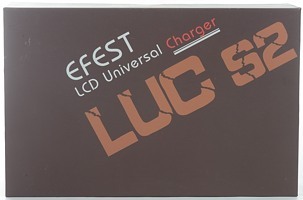 The charger was supplied by Efest for a review.